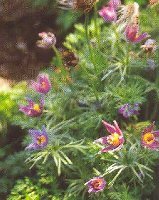 Anemones (also known as Pulsatilla) or Windflowers are one of the most charming or perennial bedding plants. Suitable for beds, rock garden, and containers or for naturalizing, these pretty little flowers belong to the Buttercup family (Ranunculaceae) and are native in many places over the world. The plants are compact and the blooms have no petals, the showy part of the bloom consisting of colored sepals. 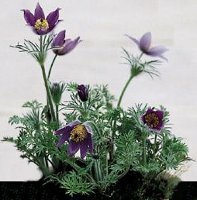 Propagation of anemones can be done by digging and separating existing plants in the fall or early spring, by taking root cuttings in the fall, or by sowing seed. Seed should be sown in early autumn, if sowing outdoors, or in fall or early spring in the greenhouse.